You’re more than $27,000 ahead if you don’t smoke! Published on July 17, 2015 in Motivation. 1 Comment Tags: Benefits Of Not Smoking, Costs Of Smoking, Smoking. According to a Danish study as reported in the July 11th edition of The Economist Magazine, the lifetime benefits to men who give up smoking at 35 are around €25,000 ($27,400), most of that in increased productivity. So if you never smoked in the first place… It’s even more than that. So what’s the moral of this story? Well, there are a few. Second, it is well understood that it’s an expensive habit for “society” that is stuck dealing with all the health costs associated with it. Less well understood are the costs allocated to the individual. The article in The Economist quantifies it scientifically at more than $27,000. I venture to say it’s much higher than that in lost (social and professional) opportunity costs. Professional opportunity costs are similar. I know for a fact that employers won’t admit publicly that they shun smokers, but they do. Many now are searching social media to confirm a candidate’s non-smoking status prior to short listing prospective interviewees. * The benefits alluded to in the Danish study do not take into consideration the costs associated with the purchase of the cigarettes that could be put to much better use… But that is another discussion for another day. 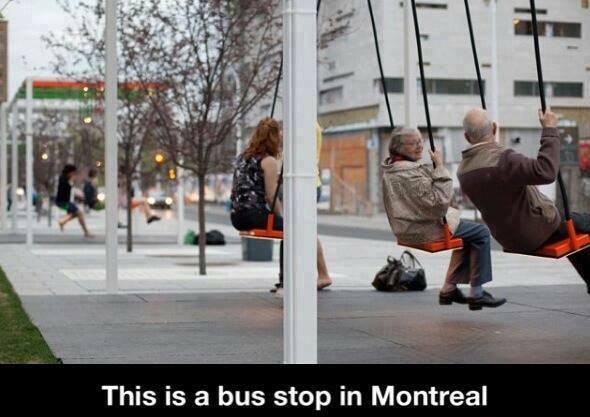 Inspirational Quote: Montreal gets into the swing of it! Published on July 3, 2015 in Creativity, Fun Stuff, General, Motivation and Positive Thinking. 1 Comment Tags: bus stop, montreal, swing.